A Chapter Book Worth Checking Out! - HAPPINESS IS WATERMELON SHAPED! 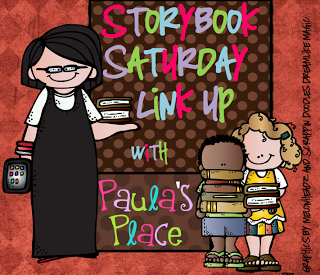 I am linking up with Paula for her Storybook Saturday Link Up! When the kids eat snack, I read a chapter book. Since school started (we've been in school for 12 days now), I have been reading a Judy Blume book from her series about the Pain and the Great One. 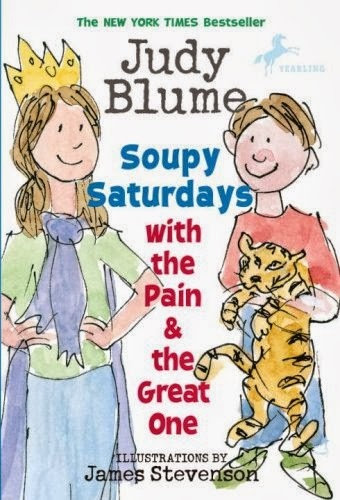 The first book in the series is titled: Soupy Saturdays with the Pain & the Great One. The Great One is the older sister who is in third grade; and the Pain is the little brother who is in first grade. The chapters are told by either the Great One or the Pain, and each chapter deals with relevant issues to children in this age bracket. Right now, I am reading Cool Zone with the Pain & the Great One because most of the chapters take place in school. In one chapter, the Great One decides to change her name because she doesn't like her real name which is Abigail. I asked my students if they would want to change their names, and if so, what would their new name be. Needless to say, the majority of the kids wanted to change their names. Overall, the stories are very realistic and can be used to discuss issues that everyone deals with. I enjoy reading these stories out loud because there is a lot of dialogue, but these books would be great additions to your library or guided reading program. What a great book to read. Thanks again for linking up.